My Neighbor, Charles (이웃집 찰스) is a South Korean reality-variety show that airs on KBS 1TV every Tuesday night. I’m a big fan of this reality TV show (actually it is more like a documentary) because I can meet various people through this TV show. Of course sometimes I feel some of guests just wanted to promote their business (restaurants or cafes) but still I can see other people’s lives who immigrated to Korea for different reasons. This is a story from yesterday’s episode and the reason why I’m now talking about this TV show on this blog because of their mother. During her interview, she said that she wants to be an ajumma, Korean ajumma. And the producer asked her why? Her answer was very interesting and touching. She answered that Korean ajummas work a lot for their family compared with Egyptian women. Also Korean ajummas are fast and strong so their mother wants to be an ajumma. I really impressed about her respondent about Korean ajumma. Yes, Korean ajummas are strong, fast and they work for their family in many ways. Of course there are some annoyed part such as they’re (some of them) sometimes loud and being meddlesome. But I think everyone can be loud or being meddlesome. Many times, we see ajummas with our biased views. 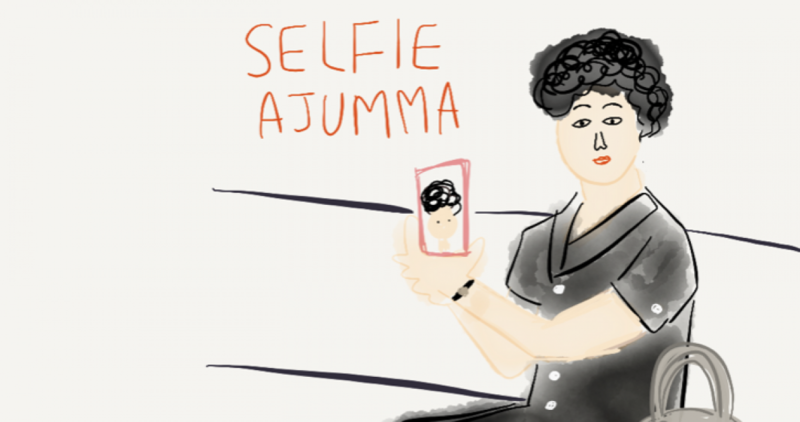 I hope we should look at ajummas from various angles even though it will take some time to change our minds and society. We should.